I don't know about you, but I'm always super intrigued to know what other people have in their makeup bags. I'm always going through my friend's makeup bags and swatching stuff on my hand (sorry, I know that must be really irritating actually). First thing is my multiple primers. I know I only need one on my face at any one time, but I have about a thousand to choose from. The one I've been wearing most lately is the Rimmel Fix & Perfect, which is alright, I'm not raving about it but it doesn't dry my face out like lots of primers tend to do. I think it just does what it's meant to do but doesn't exactly astonish me at the same time. I also have a selection of Benefit primers, including an adorably tiny tube of That Gal brightening primer. I really like this actually and keep meaning to buy a full size - it's kind of creamy and feels really good under my eyes. I also have the original Porefessional primer which (please don't hurt me, I know people love this stuff) also isn't that great to me. I'm not a fan of the texture... I do think it's great for minimising pores, however I find my makeup doesn't necessarily have any more staying power than it does wearing just drug store primers. 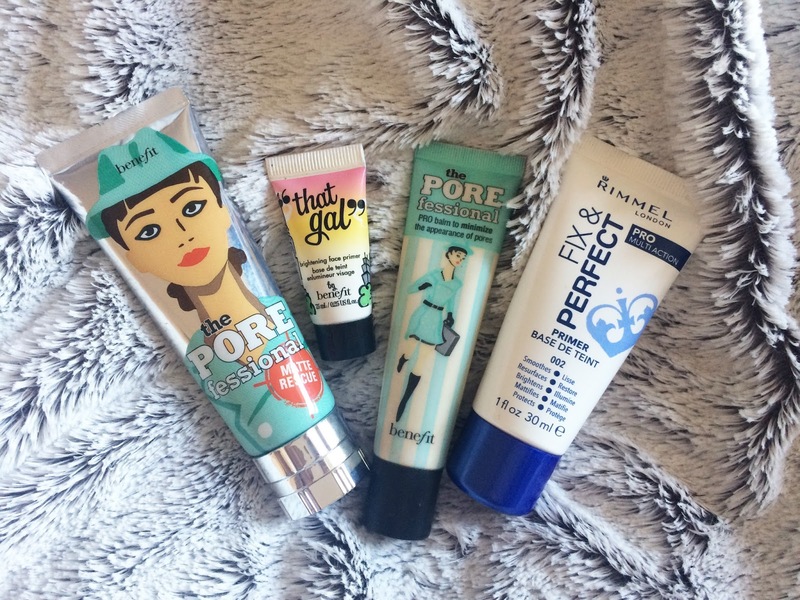 I do really love the Porefessional Matte Rescue gel though! This stuff is so good for me, a girl with tragically oily skin. 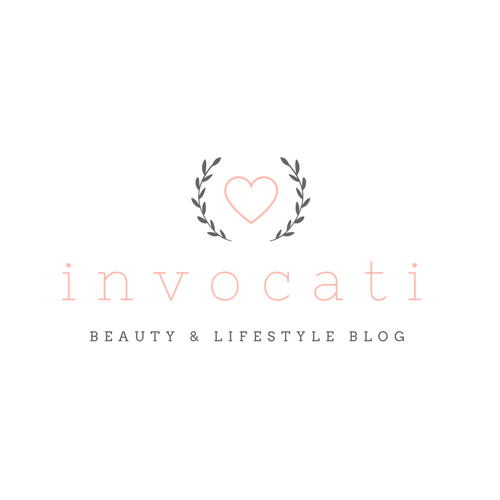 I have mentioned this product in my January favourites post, so read what I think about it in more detail there! 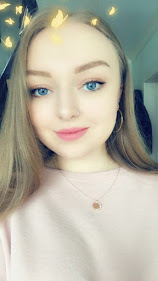 I have 2 different foundations (I honestly really don't know what I'm playing at), which are the Bourjois Paris 123 Perfect in No 51/Light Vanilla, and the Rimmel Match Perfect in 010/Light Porcelain. I like both these foundations for different reasons, but I will admit that neither are my 'holy grail' products, as the beauty gurus say. Sadly I am still trying to find the perfect foundation for my gross red/oily/dry face, so any suggestions would be much appreciated! I usually mix a bit of these two foundations together to get a better colour match for my skin, but even then it's not quite right. I've been playing around with drug store foundations for ages and never found anything that worked perfectly for my skin. I think I may have to branch out into the high-end stuff and see if it's worth the price! I don't really use concealer - I do have a tube of Maybelline Super Stay 24 Hour concealer in 2/Light. I don't really like the consistency of the formula - it's very thick and sits in the creases under my eyes. 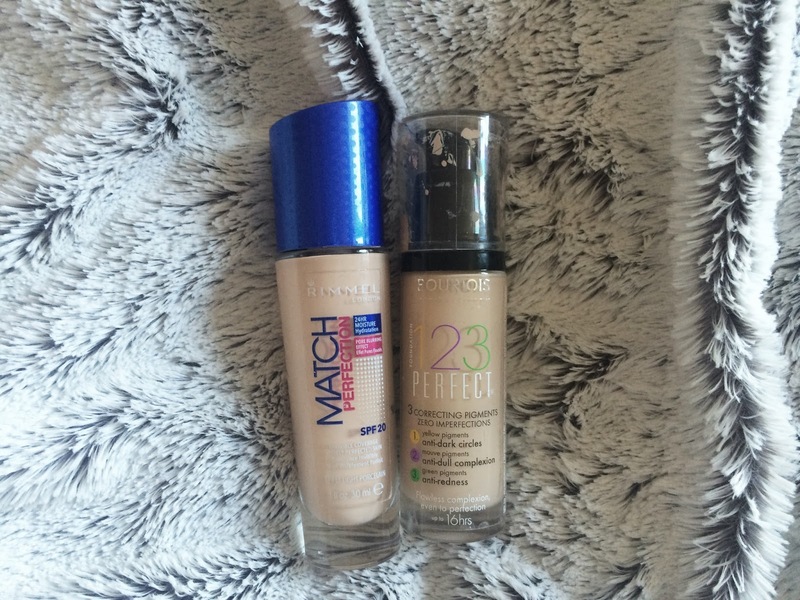 If I mix it with a bit of foundation it does tend to be more workable, but I don't use it very often at all. 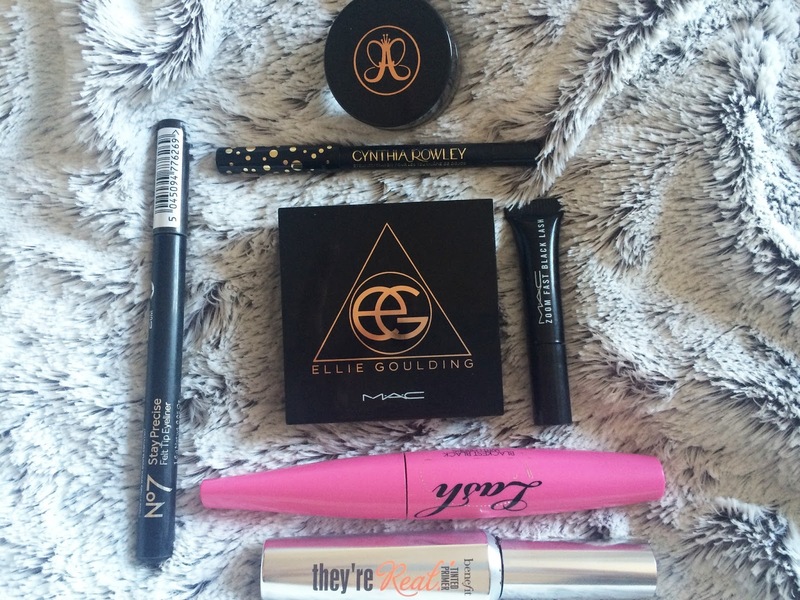 For my everyday eye looks, if I'm not using my Carli Bybel palette, I'll usually use my MAC x Ellie Goulding Halcyon Days palette. This is a quad of cream colour bases, but they're actually really pigmented and completely wearable on their own, which surprised me! For mascara, I'm using the Benefit They're Real! Tinted primer which I absolutely love. It gives my lashes such a natural colour and boosts the length and thickness so much. I generally just wear this mascara on its own because it makes such a difference to my lashes instantly. If I want a darker eye look then I usually put either Barry M Lash Vegas with the lash fibres for extra length, or MAC Zoom Fast Black Lash, which gives me a LOT of thickness in my lashes. I also keep a spare wand handy to comb through my lashes again if I have multiple costs of mascara on, so it really gets rid of the clumps. I like a big thick brush for this and my current one is from a Bourjois mascara. I've got a No7 eyeliner pen which is honestly so awful, it barely lasts and doesn't work using the very tip of it which is rubbish when you need an accurate line. I also have the Cynthia Rowley pencil liner which I got in my Birchbox this month and it's really great for tightlining, especially as the colour is so pigmented and the pencil is super soft, which is great for me because my eyes can't handle putting eyeliner on my waterline, it tickles too much! For my brows I have my number one, all time #bae - my Anastasia Beverly Hills Dipbrow Pomade in Blonde. This thing changed my entire life and is so worth the money in my opinion. I have a Revlon blush in the colour 008/Racy Rose which, to be honest, I never use. But this isn't because the blush is bad, it's a lovely colour! But my face is naturally so red I feel like it does not need enhancing! I wish I could pull off blusher... Woe is me. 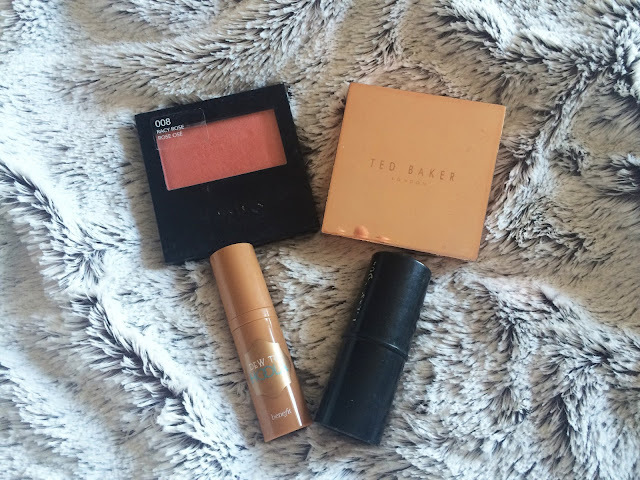 I also have this Ted Baker face palette with some pink and grey toned blushes in, but I mainly use the darker colours for putting over my contour to add deeper colour and also set everything. For highlighter I use my much raved about Carli Bybel palette from BH Cosmetics. I won't say too much more on this since its alllllllllll I ever talk about! I guess this technically isn't IN my makeup bag since its too big, but it's part of my essentials for my everyday face. 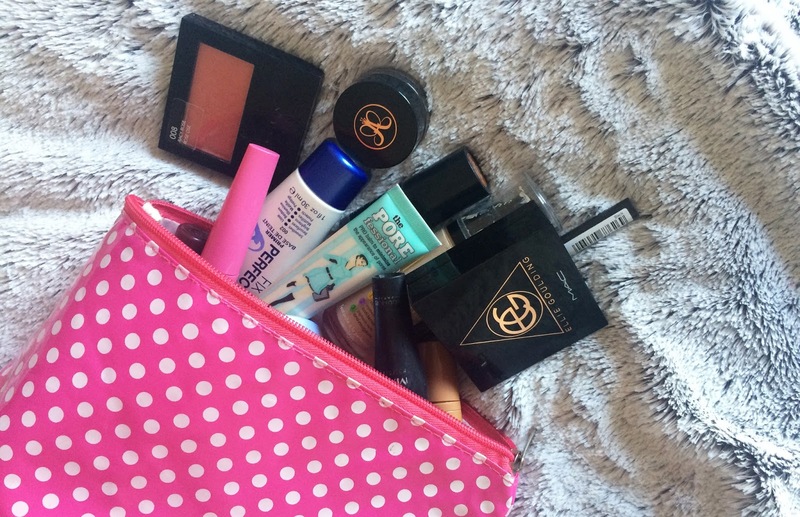 As you can imagine, my makeup bag is huge and full of crap! I definitely need a spring clear out. What are your go-to products, or the ones you use every day?